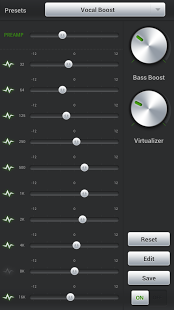 PlayerPro DSPPack is a free digital sound processing plugin for PlayerPro. PlayerPro is an advanced music and video player for Android 2.x devices. PlayerPro DSPPack provides an incomparable sound experience thanks to a high performance, high quality 10 band graphic equalizer, alongside booming bass and virtualizer effects and many audio customization options: gapless playback, cross fade, replay gain, left-right channel balance, audio limiting etc. PlayerPro DSPack supports a range of more than 30 different audio formats, from the very popular to the very specialized. In addition, it contains highly optimized ARM-NEON routines that dramatically reduce battery consumption, making it the most battery friendly DSP plugin of the Android market. !!!! 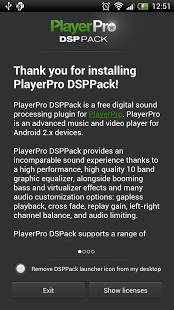 PlayerPro DSPPack v4.0 requires PlayerPro Music Player v2.8 or later !!!! 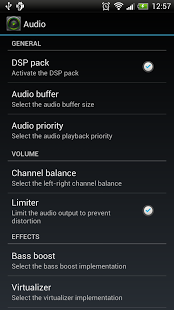 * From PlayerPro app, go to Settings > Audio and check the “Activate DSP pack” option. * Use the audio settings menu to customize playback: adjust manual and auto crossfade time, activate gapless or replay gain, adjust left-right volume balance etc. * In case you experience playback skipping, please increase the audio buffer: go to Settings / Audio and change the “Audio buffer” value. Larger buffers should reduce skipping. * Supports playback of all common audio formats, directly from PlayerPro music player: mp3, mp4, m4a, aac, wma, ogg, wav, flac. * Supports playback of some less popular audio formats, using an external file browser app like ES File Explorer or ASTRO File Manager: wavpack, aif, au, paf, iff, svx, sf, voc, w64, mat4, mat5, pvf, xi, htk, caf, sd2, sds, txw, gsm, nist, rx2, opus. * 10 band graphic equalizer with 15 default presets. * Supports any audio sample rate thanks to downsampling. * Runs on all ARM processors. Contains highly optimized ARM-NEON routines that dramatically reduce battery consumption.